Increasing sophistication in the field of digital controls continues to impact upon building management systems and processes. Networking physical or ‘smart’ devices is opening up new possibilities for the collection and analysis of data to enhance efficiency and performance in all areas. 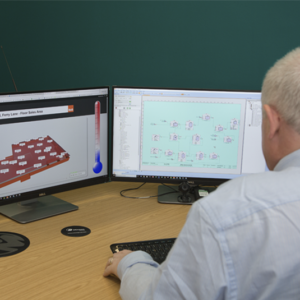 Mitton Group is continually innovating to access available data from systems such as metering, independent HVAC systems, lighting and process equipment to optimise these opportunities. The objective is to make operational data available through one common platform, with automated data analysis and production of management information to aid the decision making process for building operators. CONSTANTLY MONITORED AUTOMATIC CONTROL SYSTEMS GIVE CLIENTS THE CONFIDENCE TO KNOW THAT EVERYTHING IS WORKING AT PEAK PERFORMANCE 24 HOURS A DAY, 365 DAYS A YEAR. Mitton monitors and consults on areas including energy consumption, plant performance appraisals and specialist services, advising clients how to improve energy efficiency and save on energy costs. MITTON HAS ADOPTED A ‘WHOLE BUILDING SOLUTIONS’ APPROACH CONNECTED BY THE INTERNET OF THINGS. Ongoing investment is enabling Mitton to automate data analysis and produce management information to aid the decision-making process for building operators.